Non-destructive testing becomes more and more important with respect to quality management systems and material modelling. The paper deals with x-ray, Neutron computer tomography, US pulse attenuation, and AE analysis. It is shown that AE tensor inversion is a powerful tool to investigate the damage growth and damage extension in steel fibre reinforced concrete. There are at least two reasons why non-destructive testing is getting more and more attention. One driving force comes from industry which is interested in quality management systems, i. e. during production of concrete and construction of concrete elements, one needs to know the achieved quality in the sense of deviation from an ordered quality and in the sense of scatter of material properties. The other driving force comes from research where tools are needed which allow to look into a material rather onto a surface only. This driving force is particularly strong since bulk properties from global measurements do not reveal the mechanisms behind some phenomena. There is a demand for modelling of material properties on a meso scale rather on the macro scale only. This second aspect was mainly the reason why the research project has been carried out which will be described and discussed in the following. The X-ray technique is well suited to detect steel fibres or reinforcing bars in concrete. There are impressive examples [1, 2] which show the fibre distribution very clear. However, the application of the X-ray technique is limited because the exposure time depends strongly on the depth of a concrete member. Second, exposure to X-ray radiation is dangerous which means that strong safety precautions have to be taken. This technique is very suitable in well equipped laboratories when applied to small samples, in the order of centimeters. On the site, when real beams or slabs have to be investigated, exposure times of two hours per frame with a safety clearance of 50 m are not unusual. 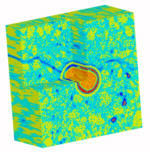 Neutron tomography is another method which allows the detection of variations within the material. When a neutron beam passes a material, neutrons are attenuated according to the atomic mass of the target atoms they encounter on their way throught the material. The neutron beam is detected behind the material. Modern devices allow the three-dimensional reconstruction of a material when sufficient overlapping pictures were taken. Air bubbles, cracks, or zones of delamination appear dark while dense material like steel or aggregates appear light grey. Fig. 1 shows an example of a steel bar embedded in a concrete cube. The 3D reconstruction contains a dark line from the upper left to the middle right which is a splitting crack in the concrete. Air bubbles show up dark. The skin of the steel bar appears light grey. Above the light grey zone, the splitting crack runs around the steel bar, i. e. the bar is partly debonded. Although neutron tomography is a powerful tool the application is restricted to laboratory experiments. Furthermore, the device is such expensive that most laboratories cannot afford it. Ultrasound transmission is used for the determination of elastic constants like Young's modulus via the one-dimensional relation of velocity v, Young' s modulus E and density r, v = (E/r )1/2. This relation assumes homogeneous and isotropic material properties and bar-shaped specimens. When cracks occur the signal is dispersed which means that the velocity decreases and attenuates. This has been proven in tests on concrete specimens  containing a saw cut in the middle. The data show (Fig. 2) that velocity decreases and amplitude decreases with elongation. The amplitude is most affected. The idea to use the attenuation of a US signal as a measure of internal cracking seems attractive and promising. Another method which relies on the propagation of elastic waves is the analysis of acoustic emission (AE) signals. AE signals develop when cracks are generated and propagate or when existing cracks propagate or slide. The type of fracture may be mode I or II. Although the AE analysis is not a pure non-destructive one it is mostly accepted as a non-destructive technique because accidental or service loading is enough to generate measurable signals, i. e. it is not always necessary to perform a destructive test. In research however it is common practice to test a specimen and to generate signals which are aimed at discovering internal phenomena in a material. The AE signal contains more information than the arrival time only. The first oscillations of a signal contain also the information of the fracture mode. To this end, the moment tensor of the signal is inverted [5, 6, 7]. First, the three fracture modes with their point force equivalent and radiation characteristics are shown in Fig. 3. A mode I fracture produces P wave signals with the same polarity of the first movement all over the focal sphere. A mode II fracture shows smaller P wave amplitudes but with a characteristic distribution of positive and negative initial slopes with respect to the orientation in space. with l and m elastic constants. Fig. 4 shows the tensor components illustrated by force couples. The tensor components are force dipoles like in Fig. 3. The trace components (i = j) do not have a moment. The direction of their forces is given by the row p while the direction of their lever arm appears in the column q of the tensor. It is common practice in seismology that the moment Mpq and Mqp are combined to a double dipole (called double couple) without common moment. The double couple (DC) component is a measure of the shear fracture contribution of the fracture. Additional information on the fracture is given by the isostatic parts (ISO). K is the shear modulus in case of shear fracture, and the compression modulus in case of cleavage fracture. The seismic moment can be used to compare the size of different fractures, similarly to the magnitudes of an earthquake. Order of magnitude of the seismic moment are 1023 Nm for earthquakes, 105 Nm for micro earthquakes and 10-2 Nm for micro fractures in laboratory specimens. It is not easy to draw the moment tensor. When the tensor is transformed to principal axes one gets three eigenvectors with appropriate eigenvalues. In case of an explosion, obviously all three eigenvalues are the same and positive. A cleavage fracture leads to one eigenvalue (of the tensile direction) which is larger thatn the other two. A pure shear fracture has one zero eigenvalue and the other two have the same amount but different sign. These characterisitics can be used for the presentation of the moment tensor. The eigenvector with the largest eigenvalue determines the direction of the largest tensile stress (T axis), the one with the smallest eigenvalue gives the direction of the longest compressive stress (P axis). Both vectors can be projected onto the source half globe and, for instance, drawn in are true azimuthal projection according to Lambert. This type of presentation is very informative for seismic fractures which are mainly shear fractures (see Fig. 5). The figures show the fracture type (left), the emission characteristics (middle), and the schematic projection (right), all in side view. Viewed from top (xy projection), the principle axes and the polarity fields appear on the left and a point cloud on the right as result of a moment tensor analysis with scatter areas. However, the analysis does not determine the fracture plane unambignously. The two principal stress vectors must be inclined to the fracture plane under an anlge of 45 degrees. This means that the fracture plane can be situated as shown in the left part of Fig. 5 or normal to it. The real location has to be determined in an experiment from known stress. The signals were detected by broad band sensors (type UEAE, GEOTRON Electronics, Germany). These sensors have a high sensitivity up to more than 500 kHz. The sensors were fixed to the surface by a molten thermoplastic mass. After preamplification the signal is fed into a up to 12 channel transient recorder (type W + W, Switzerland). It has a sampling frequency of 1 MHz and a resolution of 12 Bit. This results in a band width of the signals of 500 kHz with 72 dB dynamics. 1 ksamples of data per signal is equivalent to a recording time of about 1 ms. This is enough for the complete signals to be recorded. The time lag of the transient recorder amounts to 10 ms which is needed for storing the data and reinitialising the recorder. It was possible to store more than 1000 signals per experiment. One single fiber was embedded in concrete over half the fiber length. The concrete composition is given in Table 1. The fibre was a Dramix ZC 60/.80 with hooked ends (length 60 mm, fibre diameter 0.80 mm). Eight sensors were mounted on the surface of the cube as shown in Fig. 6. For illustration purposes a cube was sawn to show the embedded fibre (see Fig. 6). The free end of the fibre was embedded in a PMMA tube by X60 glue. The tube could be clamped in the grips of the testing machine. The force displacement curve together with the cumulative acoustic emission events are shown in Fig. 7 (the displacement is given as cross-head movement). After a steep increase of load the force-displacement curve flattens and changes to a softening behaviour. During the steep increase there are only a few acoustic events (AE). The AE activity increases considerably when the load-displacement curve flattens. Phase A of Fig. 6 corresponds firstly to the debonding of the fibre which does not cause AEs and, secondly, to the damage evolution of the matrix which causes AEs. Phase B is due to the slip in the matrix channel which was the place of the fiber in the matrix. Hardly any more AEs occur. Finally the fibre slides in the channel after it was deformed from a hooked end into a straight fiber. The pull-out resistance is due to friction which does not cause more AEs. The arrival times of all eight signals were automatically picked with the software "WinPecker". Fig. 8 shows an example of waveforms as arrived at 8 sensors. The arrows point to the arrival times. Using eqs. (1) to (3) the locations of the events could be localized. The result of several localizations is shown in Fig. 9. On the left, the xy-projection contains most signals in the centre of the square which is the place of the embedded fibre. 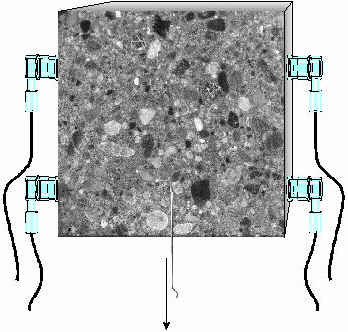 There are two locations which do not fit into the picture since it may not be assumed that fracture can occur in concrete at such low stress levels. It must be assumed that two localizations were not correct. The full dots correspond to phase A according to Fig. 7, the open squares to phase B, and the open triangles to phase C. Phase A and B are characterized by fractures of the matrix and the interface fibre/concrete while phase C corresponds to the friction part. During phase C almost no AEs occur anymore. Looking to the depth where the AEs occur (xz-projection on the right of fig. 8), it is obvious that most of them are first situated along the fibre and second at the hooked end of the fibre. The AEs during phase B are due to the straightening of the end hook and take place some distance apart from the end of the fibre. There are only two events monitored during phase C and they are close to the lower end of the fibre. So, the load-displacement curve and the AE vs. displacement curve (Fig. 7) correspond very well with the locations of events (Fig. 9). It is interesting to look at the frequency spectra of signals. Two examples will be shown, one from phase A and one from phase C since these should be rather different. Phase A generates AE by matrix fracture and phase C by frictional sliding. Fig. 10 illustrates that the phase A signal contains a broad spectrum up to 400 kHz while the phase C signal is almost monofrequent at 120 kHz. These characteristic features have been observed many times and seem to be suitable to differentiate between mechanisms. Finally a moment tensor inversion has been performed. Three signals have been evaluated and are given in Fig. 11. The signals stem from phase B and have been generated close to the fibre. The signals have a great shear component but are not a pure mode II signal. The orientation of the principal compressive and tensile axis are quite different and have different inclinations with respect to the fibre axis. Concrete with 1% by vol. Dramix ZC 30/.50 has been prepared. The concrete mix was the same as in Table 1. The beam with a length of 700 mm, a width of 150 mm and a depth of 150 mm was notched at the middle of the span up to one third of the depth. A three point bending test was performed in a displacement controlled way. AEs were monitored and localized. Fig. 12 is a sequence of AE plots presented in the yz-plane (left) and the xz-plane (right). The first plot is caused by matrix fractures. The subsequent pictures show how the AE active zone expands in all three coordinate directions. The AE zone is about 200 mm long and spreads over the hole depth and width, i. e. the zone size stretches about 3 times the fibre length (which is 30 mm) on both sides of the notch. A similar beam has been used for US transmission measurements. This time 1% by vol. Dramix ZC 60/.80 has been mixed into the concrete matrix. Force, velocity and transmitted energy have been measured and plotted as function of deflection in Fig. 13. The force-deflection line starts as a straight line up to the cracking force. Then, the inclination of the line decreases but keeps absolutely increasing up to about 12 kN. The velocity starts at about 4450 m/s and drops to 4430 m/s at the cracking point. With increasing deflection the velocity decreases finally to 4350 m/s. This is a relative decrease by about 2%. The transmitted energy is given in relative terms and drops from 90 % at the cracking point, ending up at a value of below 20 % after maximum load. This result means that the decay of energy transfer is much more sensitive to damage in the zone around the notch than the velocity decrease. This is in accordance with [8, 9]. Although there are several methods available which allow to "look into steelfibre reinforced concrete" like x-ray or neutron tomography these methods are not useful for practical application. They may be used for sophisticated laboratory experiments. Acoustic emission techniques are well developed and allow a localization precision of less than 10 mm when eight sensors are applied. The signals can be evaluated by moment tensor inversion which lead to the determination of fracture type. By this, mode I and mode II can be distinguished. Ultrasonic wave propagation is widely used for the detection of cracks and delamination. The measurement of velocity decay seems to be less sensitive to damage than the energy attenuation. In the future, even more features of the transmitted signal will be determined in order to exploit as much information. Nondestructive testing will be a useful tool for quality management and will enhance the application of fibre reinforced concrete . Additionally, combined analysis techniques including results of quantitative acoustic emission as well as simulation techniques (Finite Elements) will be used to validate the statements of these methods for fracture mechanical analysis [11, 12]. Furthermore, the application of quantitative techniques in-situ will be promoted in collaboration with several working groups in Germany  and abroad . The authors are indebted to DFG (German Research Community) for financial support. They like to thank Mr. G. Schmidt for substantial assistance in preparing testing devices and performing tests.